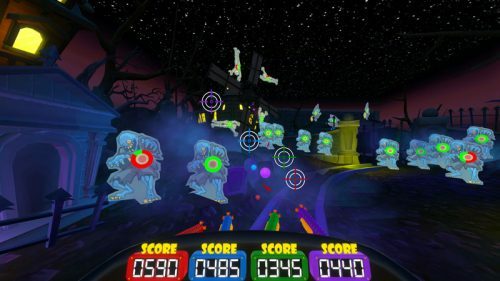 Carnival Games was originally released on the Wii in 2007. 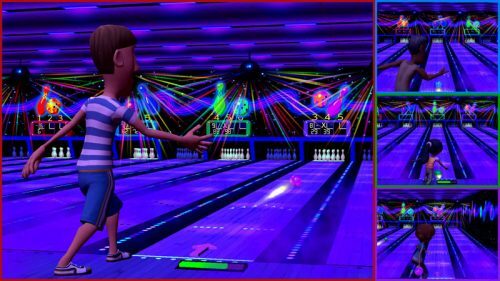 As the Wii had captured the casual gamer audience with titles such as Wii Sports, the system quickly became a hotbed for mini-game compilations. Some of these garnered favourable reception such as the Raving Rabbids series, but for every genuinely good title there was a host of bad ones. Carnival Games was sadly in the latter crowd, offering up little content and a lacklustre mini-games collection. Fast forward to 2018 and Carnival Games makes a return on Nintendo Switch, but once again it fails to deliver an engaging experience. 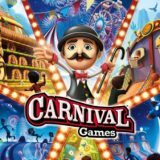 Carnival Games features a barebones collection of 20 mini-games and a handful of different game modes. Free Play lets you browse the collection and play whatever takes your fancy. Tournament mode allows you to play a Decathlon round where you play ten random games or a World Circuit round where you play all unlocked mini-games. The Decathlon round in particular can get frustrating as it doesn’t delist the mini-games you have already played, meaning there’s a high chance you will have to play through the same mini-game multiple times in a round. Initially players will only have eight mini-games unlocked. To unlock the other 12 you have to play the available mini-games and collect in-game Tickets, which are awarded based on how well you perform. The problem here is that the number of Tickets you win, at most, will be a few dozen while the locked mini-games will require anything from 100 to 1,000 Tickets to become playable. When the total number of mini-games is already small, forcing players to focus on an even smaller selection gets incredibly repetitive. There are some challenges to complete for each mini-game, though these only include winning a match against 3 hard AI opponents, scoring a certain amount of points and one unique challenge. Tickets can also be used to purchase bonus music tracks for mini-games and outfits to customise player avatars. The actual mini-games are themed on sideshows you would play at a carnival (or the annual Royal Show for Australians). 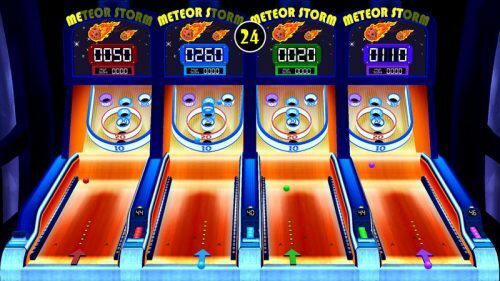 You have favourites such as alleyball, ball toss, ring toss, darts, basketball shooting, batting cages and shooting ranges. There are also other, less carnival-like ideas, including collecting the most bananas while jumping, racing on pigs and exploding dynamite sticks with horseshoes. On one hand it’s a nice collection of virtual versions of these classic sideshows, and yet the controls for each mini-game are sluggish and unrefined. An example is ring toss, where you have to aim an arrow and then throw a ring onto a peg for points. Throws are controlled by pressing and holding the A button, then releasing when the power meter has reached your preferred level. The throws feel too overpowered – it’s actually possible to throw the ring across the stage with a little over half the meter full. In fact, I personally performed better by just randomly throwing rings in every direction with little to no thought on what I was doing! 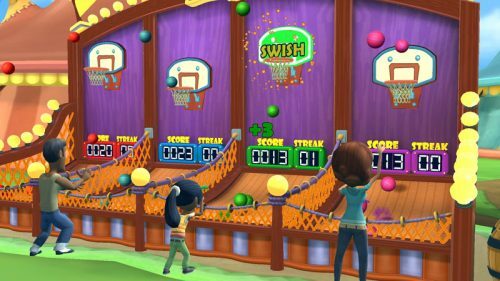 With better design the mini-games could have really captured the thrill of the real life sideshows games, but instead you’re left with an uninspiring mess. For the Switch version at least, there’s an option to play with motion controls. These are your average run-of the-mill waggle motions that we’ve all become accustomed to since the era of the Wii – i.e. swing the Joycon controller to use the bat, throw the ball, etc. However, for some unknown reason these are not available from the start. You have to complete the Score X Amount of Points challenge before the option becomes available. This just alienates players who may have wanted to play the game exclusively with motion controls. Each mini-game is designed for four-player multiplayer, so you can either play with AI opponents or up to three other human players. Like most party titles, Carnival Games is at its best when playing with friends and family. You can play off each other by insulting rivals and encouraging allies when playing in teams. But considering Super Mario Party was released only a month ago and the Switch already has a great library of multiplayer-focused titles, Carnival Games really doesn’t stand out from the crowd and will be long forgotten within a few short hours. 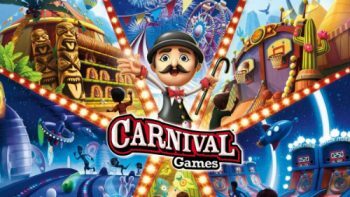 Carnival Games is not a visually appealing title. Character models and environments are average and don’t push the boundaries of this console generation. There are some charming details however, such as animatronic cardboard alligators moving their mouths in the background while you bat baseballs across a fake stadium. Sure, it’s tacky, but it’s also reminiscent of what you would expect at a real carnival. It’s difficult to recommend Carnival Games to anyone. The game is highly repetitive, has an overall lack of content, has unrefined controls and just isn’t much fun to play. With so many other multiplayer focused titles available on Switch, Carnival Games just doesn’t stand out and will be quickly forgotten. Rocket Chainsaw reviewed Carnival Games on Nintendo Switch. It is also available on PS4 and Xbox One.